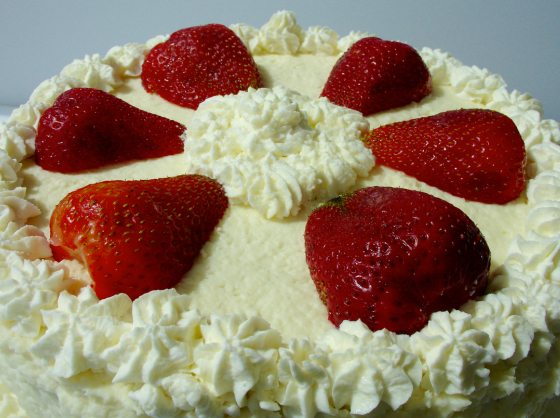 For Mother's Day, I fully intended to bake my mother's favorite strawberry cream torte. Except for one thing—I forgot to buy cornstarch. The German spongecake recipe she has used for years contains cornstarch. Sigh. So I turned to BAKING ILLUSTRATED by the Editors of Cook's Illustrated Magazine to see how they make a spongecake. Interestingly, they use part cake flour and part regular flour. Now I could be very wrong about this, but I bet the cornstarch in the German recipe somehow acts like the cake flour does in the American recipe. Guess what. 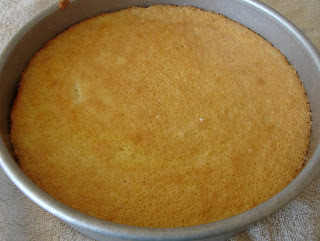 I have a new favorite spongecake recipe! I admit having my doubts about it because it contains a little bit of butter. Hmm. But it came out great. And I didn't even use cake flour. I hear everyone gasping. It's true, I dared to use ordinary flour, and it still turned out great! Note that I used 3/4 cup flour but the original recipe calls for 1/2 cup plain flour and 1/4 cup cake flour. Lucy Burdette and my mother have never met. But they like the same kind of cake. Not too sweet and forget the sugary buttercream. Bring on the real cream. So if you're a sugar lover, then pass on this cake. Although I have made this type of cake many times, I learned something from this one. The strawberries at the store were huge. 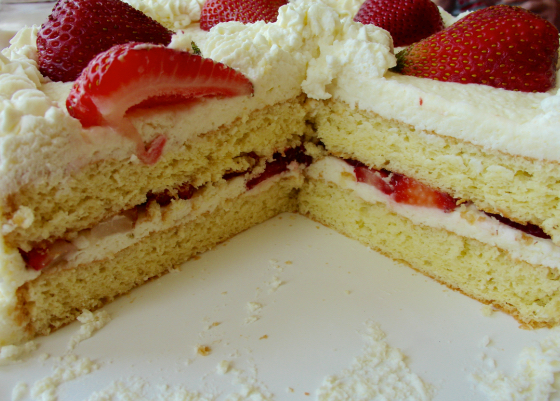 This cake really works best with lots of small strawberries. Because they were so large, the cake didn't have enough fruit in it (for my taste). I made the cream with gelatin. Can you use whipped cream without the gelatin? Yes. 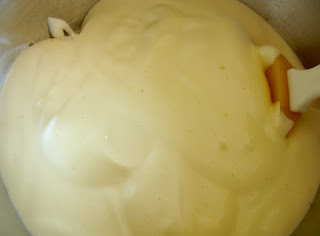 But the gelatin stabilizes it and keeps the cream from collapsing and getting watery. If you know that the cake will be eaten the same day, I'm not sure I'd bother with the gelatin. Your choice. Preheat oven to 350. Grease two 8 or 9-inch baking pans. 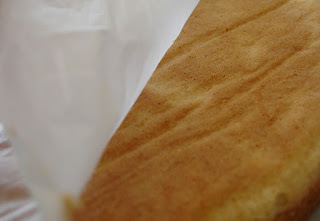 Cut parchment paper for the bottoms and insert. Separate the eggs into two mixing bowls. 3 egg whites go in bowl one. The 3 egg yolks go in bowl two. Add the remaining 2 WHOLE eggs to bowl two. Beat the egg whites on a low speed until foamy. Then increase to medium speed. (NOTE: I used #4 setting on my KitchenAid stand mixer.) Beat to soft, moist peaks. Add 6 tablespoons sugar and beat. Do not overbeat! They should still be a little bit soft. Add six tablespoons sugar to bowl two. Beat on medium-high until thick and lemon-colored, approximately five minutes. Pour over the contents of bowl one. Sprinkle the flour mixture over top. Gently fold everything together with about 12 strokes. Make a little pocket on the side of the batter and pour in the butter. Continue to fold until the flour cannot be seen and everything is incorporated, approximately another 8 strokes. Bake 16-20 minutes. When touched, it should be firm but spring back. Remove from oven, place on kitchen towels, and immediately loosen by running a knife around the edges. Place a plate over top, and grip with the towels to flip. Peel off the parchment paper. Flip from plate onto cooling rack. Cool before frosting. I will be the first to admit that this can be a little tricky. The resulting cream will not be as smooth as plain cream is. Take your time. It doesn't take long, but you can't hurry the gelatin. 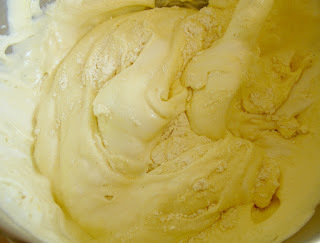 If using cream to decorate, beat the cream and add the sugar. 1 large carton small strawberries. Set aside 3-4 pretty ones for the top. Place the bottom layer on a serving plate. 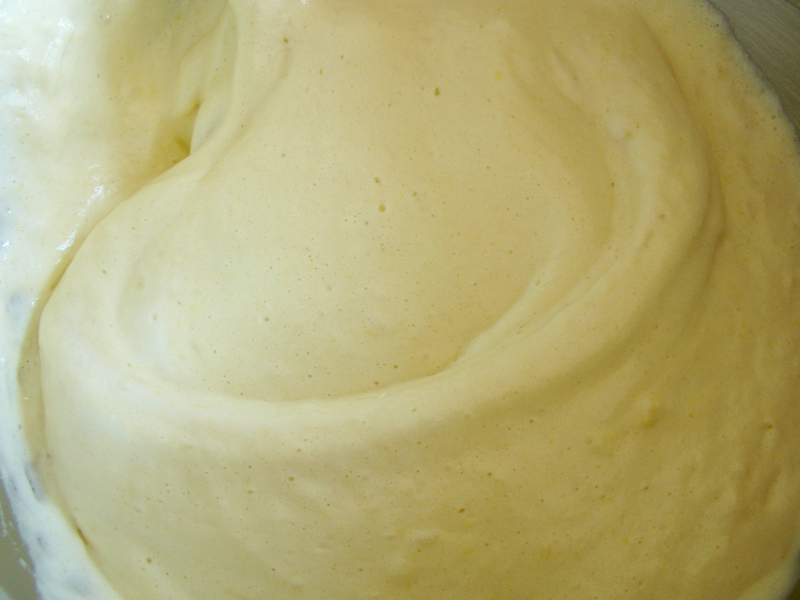 Top with cream and spread. Hull and half the strawberries and arrange on the cream. Place the top layer over the strawberries. 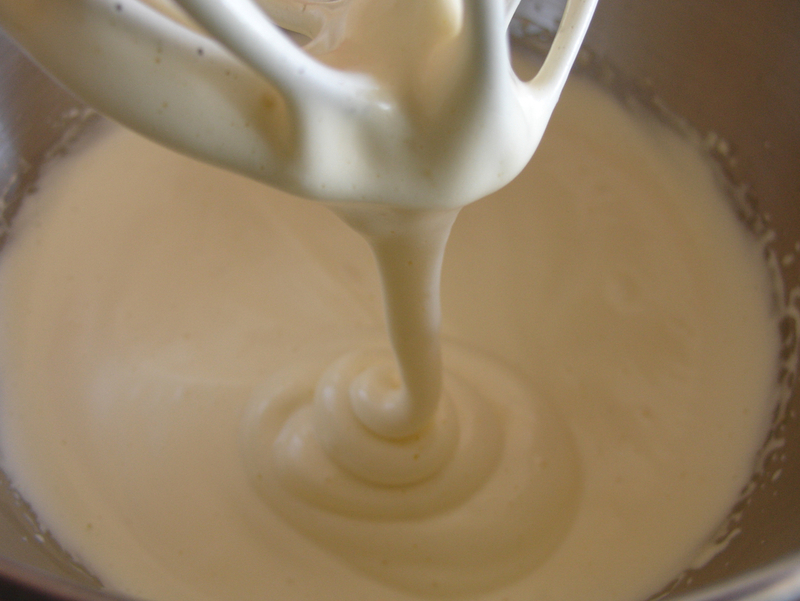 Spread cream over top and sides. Ideally, you will have enough strawberries to half them and place them around the base, point up. If not, them pipe cream at the base and on the top. Add halved strawberries to the top. Beat bowl 2 until thick. Pour bowl 2 over bowl 1. Thank you for the recipe. Looking forward to the book!! Lovely series! Thanks, Dee! I hope you'll like the book! Thank you for the recipe, and I think the cake turned out lovely (awesome pictures). 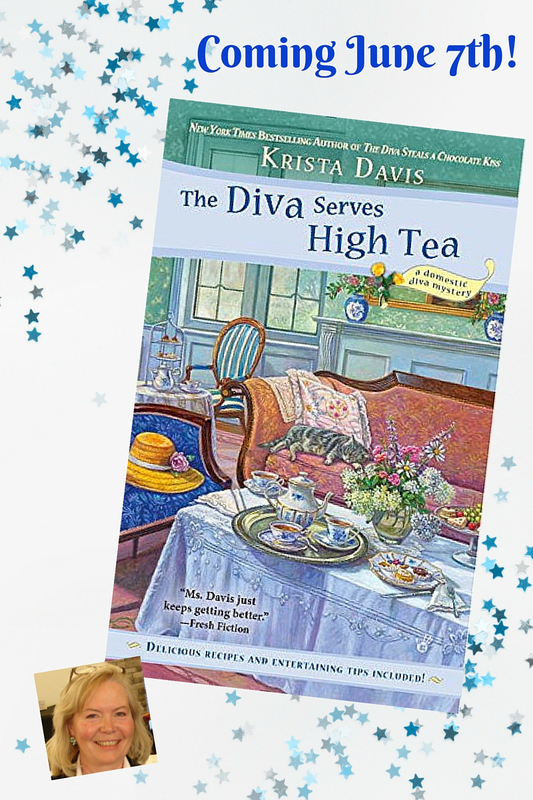 I can't wait to read Diva Serves High Tea. Hi Jen! Fingers crossed that you'll like High Tea! The cake looks delicious. I've never tried to make a sponge cake, but this recipe sounds like I should give it a try. Mason, the folks at Cooks Illustrated work through recipes very carefully. I was thrilled with this spongecake. She was delighted, Lucy. I thought it needed more strawberries but she loved it and asked for a second mini-slice! So pretty! I think the cake flour might give it a finer texture, but modern flour is already finer than in the old days. Close enough! I've never tried a cake recipe with cornstarch. I've never been quite sure why the recipes use cornstarch. This recipe said they tried using only cake flour but the resulting cake was too delicate. That cake looks so good!!! Beautiful cake! I love the idea of using whipped cream for the frosting! It's a different taste, Kim. But the cream makes up for the lack of butter in the cake and the fruit adds the much needed acidity to balance it. Boy does this look delicious! I've never heard about the gelatin in the whipped cream trick. But frankly a cake never lasts longer than a day around our house! I have found gelatin in cream in a lot of German recipes. It has one other advantage—the cakes slice beautifully! Perhaps the large strawberries for the filling would do better if cut smaller and allowed to macerate with a touch of sugar before adding them. More is always good, too! Libby, I fear macerating them would make for a juicy mess. Adding more on the outside probably would have done the trick for my taste.